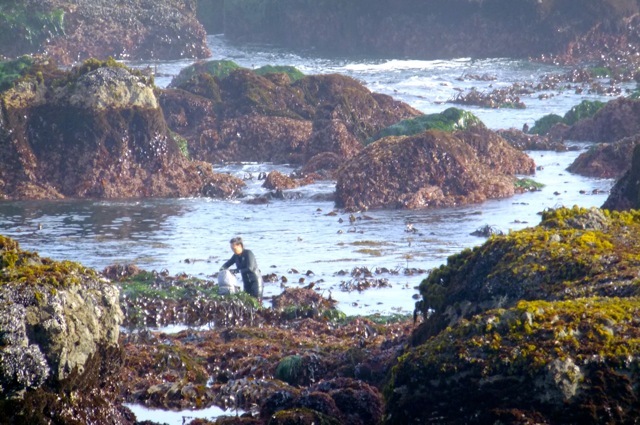 What Does Sustainable Seaweed Harvest Look Like? My post on nori harvest two years ago was vague because I was hesitant to encourage more people to get out there and possibly damage the environment. As individuals we have responsibilities not to over-harvest, but like many issues the large-scale commercial operations and loss of habitat are the real culprits. If that is the case, why should we care? I think we cultivate an attitude of respect that reverberates throughout our lives and to all we contact. What can we do to both protect the marine ecosystems and provide nutritious edible seaweed for our families? The importance of pollution-free waters because some seaweeds accumulate metals and become contaminated by sewage, agricultural, industrial, and radioactive wastes. Protect the plant’s viability by cutting rather than pulling or raking. Cutting distance from the anchor point to allow for regeneration. Industrial processing converts seaweed into the raw materials carrageen and alginate, basic components that act as gels and glue in everything from ice cream to paints and cosmetics. Global consumption is roughly 21 million metric tons a year. More than 95 % of global seaweed production is from farmed operations. But before the last remaining wild stands are dragged and vacuumed, the Marine Stewardship Council, an international organization recognized for eco-labeling will set standards by January 2015. Europe countries bordering the north Atlantic are also establishing their own criteria.